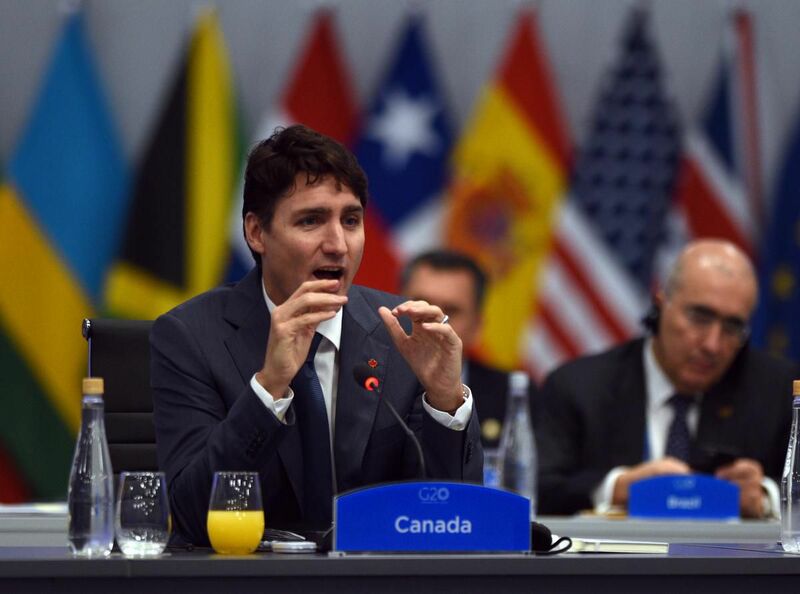 Prime Minister Justin Trudeau did not back away from approaching the two most controversial, and possibly most despised world leaders at the Group of 20 economic summit in Argentina this weekend. Mr. Trudeau approached Saudi Arabia’s Mohammed bin Salman and told him that better answers over the murder of journalist Jamal Kashoggi were needed, and brought up the “humanitarian catastrophe” of Yemen. Trudeau said he talked to the other quite unpopular leader at the summit, Russian President Vladimir Putin. The Canadian prime minister reiterated Ottawa’s demand that Moscow release the captured Ukrainian sailors from the Sea of Azov incident from Nov. 25, causing a dramatic increase in Russia-Ukraine tensions. On Friday, Canada crafted a Group of Seven foreign ministers’ statement that condemned Russian aggression in Ukraine and urged the release of detained sailors, with Ottawa leading the charge. Trudeau was asked by a reporter if he was worried about backlash from Putin, but he said there was not an opportunity for the Russian president to respond. Canadian relations with Saudi Arabia and Russia are frosty right now. A diplomatic spat sparked by a Canadian embassy tweet earlier this year that condemned the Saudi human rights record led to strained tensions with the kingdom, however, a $15 billion arms deal with Riyadh still stands. Canada has openly condemned Russia for its aggression against Ukraine since the annexation of Crimea in 2014 and its backing of pro-Russian separatists. Trudeau did not back down at the summit from confronting the two leaders, but that may not satisfy those that have criticized Canada’s arms deal with Saudi Arabia, arms that could be used in the Yemen conflict. More details to follow. Image of Justin Trudeau at G20 from the Toronto Star.